I'm so happy to introduce today's sponsor: Peculiar Momma Vintage! Shalet's eye is spot on, and she does a fabulous job of hunting down just the right pieces to share in her Etsy shop. 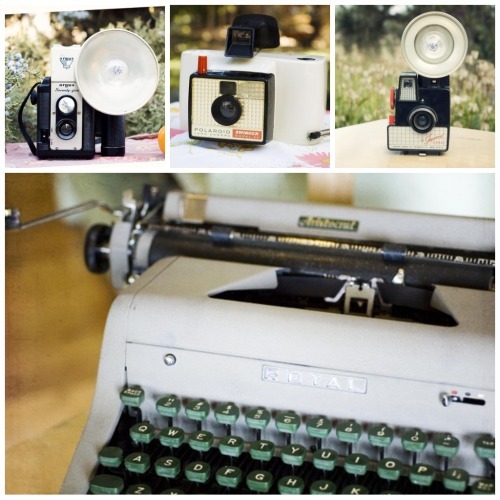 The"shelves" are filled with a steady stream of lovely vintage typewriters,cameras, handmade items and photographs . 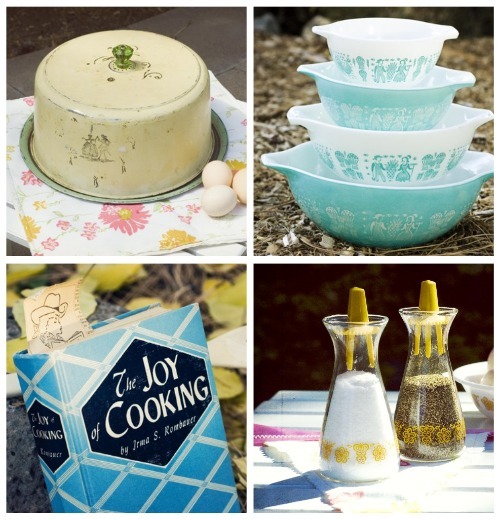 And if you love old classic and retro kitchen wares... she's got them, too. Wouldn't it be fun to do your holiday cooking in that collection of Pyrex bowls or show up at a gathering with your baked goods in such a sweet cake tin (love the cut glass handle!)? To help you get to know Shalet a little better and understand more about her shop, I decided to share what Shalet wrote in her Etsy profile. I think you'll get just why I'm so happy she's up in my sidebar! "I'm am so many things I never thought I'd be -- a crafter, a knitter and a sewer. A baker, a canner and an embroiderer. A writer and photographer. And a woman with a *huge* soft spot for vintage items. I'm also a few things I always knew I'd be: wife, a mama and a veterinarian. My "day" job (which is really a night job in the ER) is fulfilling and a dream come true. But it also carries a lot of stress. Over time the stress takes a toll and I need an emotional outlet.So I seek solace at home. 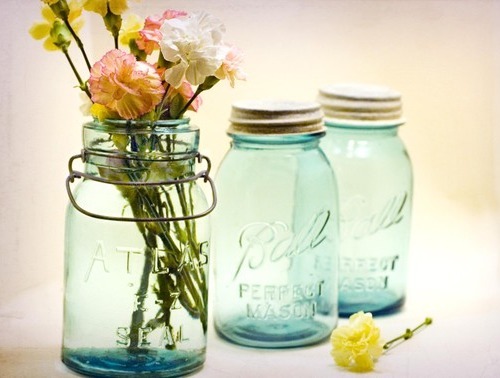 I bury myself in the art of homemaking -- cooking, baking, canning, sewing and knitting -- to name a few. I adore the soothing repetitive nature of these tasks. The rhythm of our home puts my mind and heart at ease. (I must tell you, however, I'm not so good at cleaning. Mr. Peculiar would be thrilled were *that* my hobby).Of course I also need to get out of the house - at least on occasion. So what do I do? I go thrifting! It's exciting to rescue forgotten treasures, bring them into the light and give them life again.Only here's the thing. My family only needs so many thermoses and typewriters and vintage cameras. Yet I can't help bringing them home. And we only need so many dish towels, knit wash clothes and appliqued tee-shirts. Yet I keep making them.This is where you come in. Each and every time you buy an item from my store you allow me to continue with my hobbies. And by permitting me my hobbies you give me my sanity.So thank you. Thank you for stopping by. Thank you for loving old and upcycled things. Thank you for buying them and thank you for giving them a good home. Oh yes - did I mention I also write? I can be found blogging here." Peculiar Momma's blog is so worth reading... she's wonderful with words, engaging and thought provoking. And her shop... well, as you can see from the smattering of photos today, it's a fantastic destination for all of your vintage and handmade longings. Do go give her a visit. Thanks, Shalet! So glad your Peculiar Momma Vintage shop is here!